Cleveland, OH (April 14, 2010) – According to figures released today by the Greater Cleveland Automobile Dealers’ Association (GCADA), March 10 v. March 09 new vehicle car and truck sales increased 23% when removing sales statistics for the Hummer, Pontiac and Saturn brands. New and used vehicle sales combined increased 12% in March 10 v. March 09 (Statistics for the Hummer, Pontiac and Saturn brands were removed). Ford continued to lead all automakers followed by Toyota and Chevrolet for Northern Ohio new vehicle sales. “The spring selling season opened on a strong note as the 2010 Cleveland Auto Show ended at the beginning of March. The impressive sales results continued through the entire month as consumers returned to showrooms in search of a new vehicle. ” says Louis A. Vitantonio, Jr., President of the GCADA. 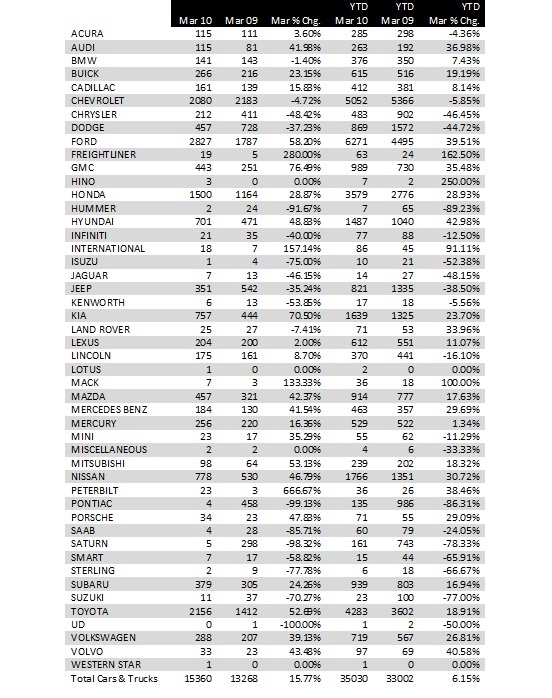 The following twenty brands posted sales increases in March ‘10 versus March ‘09: Acura, Audi, Buick, Cadillac, Ford, GMC, Honda, Hyundai, Kia, Lexus, Lincoln, Mazda, Mercedes-Benz, Mercury, Mini, Mitsubishi, Nissan, Porsche, Subaru, Toyota, Volkswagen and Volvo. Through March, 2010, twenty brands posted year-to-date sales increases in the region. They are: Audi, BMW, Buick, Cadillac, Ford, GMC, Honda, Hyundai, Kia, Land Rover, Lexus, Mazda, Mercedes-Benz, Mercury, Mitsubishi, Nissan, Porsche, Subaru, Toyota, Volkswagen and Volvo.